Hari Batti's Green Light Dhaba: Good News Bad News: Farmers, Freedom, and the Dhaba's first Used-Book Give-away! Good News Bad News: Farmers, Freedom, and the Dhaba's first Used-Book Give-away! Maybe the pro-farmer claim was merely a typo or proofing error. They just dropped the word “corporate” before “farmer.” Reinstate that and all is true. This is a budget crafted for, and perhaps by, the corporate farmer and agribusiness. Further, over 70 per cent of Indian farmers are net purchasers of foodgrain. (Between 55 per cent and 60 per cent of the average Indian farm household's monthly per capita expenditure goes on food.) Huge rises in food prices crush them. Sainath also suggests that efforts to replace the subzi walla with corporate middle men are likely to do more harm than good. Agricultural and food policy is incredibly complex--but it also happens to be incredibly important. Simply dreaming up new slogans and printing photos of farmers with mobile phones will not, I regret to say, lead to food security, nor is it likely to address the desperation that leads so many farmers end their own lives every year. I doubt that offering huge giveaways to the "big fish" will help much either. I hear a lot of complaints about The Hindu. Some of them are true. But columns like this one by Sainath are why I still read it. You can see it on-line, for free, here. Speaking of good journalism, Tehelka's done a nice job this week with their cover story on Bt Brinjal--what happened, why it matters, and what we can expect next. The article takes an extensive look at the issue from all kinds of angles. After reading it, I feel even more strongly that environmentalists all over India should feel proud that we were able to slow down the biotech steamroller, at least for the time being. Apart from many other disturbing provisions (see box: Wrong Bill for Wrong Reasons), most shockingly, Section 63 of the NBRAI Bill proposes imprisonment and fine for anyone who “without evidence or scientific record misleads the public about safety of GM crops”. That could put all activists and journalists in jail for merely asking questions. Hmm, I guess Monsanto and it's friends in government have decided to take a new approach: if you can't beat 'em...beat 'em--or at least lock them up so they can't cause you any further problems! Repressive, un-democratic corporate-government alliances have happened in many parts of the world, many times before, of course. (If you want to read a whole book about it, try reading The Shock Doctrine by Naomi Klein.) But that doesn't mean we should sit by and let it happen here. Enough of the bad news! A couple of weeks ago, at the bottom of this review of Kaveri Gill's Of Poverty and Plastic, we offered a well-worn copy of the book to the person who wrote the most compelling email explaining why she or he just has to read it. The deadline for the contest has passed, and today the Green Light Dhaba is pleased to announce the winner: Space Bar! Space Bar won because she wrote not just one, but three reasons why she should have the book! And in case you think she was just following the old "more is better" strategy, please think again. All three of her three reasons qualify as compelling, as required by the contest rules. 1. Space Bar wrote a book for very small children called Kabadiwala (the publisher changed it to Cheenu's Gift but the story remains the same). You can buy it here. I confess I haven't read it yet, but I am surely going to do so soon. 2: Space Bar is deeply concerned about bathrooms and sewage. To prove it, she sent some links on the subject, which I put up at the Dhaba on Saturday. 3. Space Bar is interested in traditional methods of recycling, which she wrote about in her contest entry. With reasons like that, I hope you can see why our panel of judges was unanimous! Congratulations, Space Bar! We'll be sending the book your way soon. Finally, March 22nd is World Water Day, and the Indian Youth Climate Network is organizing events in several places on that day. Find out more here. Not the only, but the most serious and the first! I think I agree that the more middlemen there are, the worse off the industry is as a whole with higher prices for consumers and possible fleecing of the farmer. @Bhagwad, I think it is really, really important to figure this out--but I don't pretend to have done that. Let's hope some very smart people are working on it! One lesson I got from Kaveri Gill's book on the plastic recycling industry is that when you really do a thorough analysis of the steps in a supply chain, you often find that the people in the middle do valuable work; they move things around, manage risk in volatile markets, etc. The "food chain" is not the same as the post-consumer plastic chain, but to really figure it out, you'd need to do more than send a reporter to the wholesale market for a day. I think Sainath's point is that we need to be careful of who we scapegoat for what. 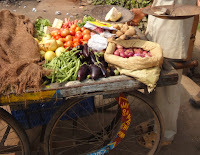 The fellow with a vegetable cart takes a much smaller cut than the big retail markets that would like to replace him, for example. Nice to see you!